Staff from Malvern Hills District Council did ‘something funny for money’ and went plogging to raise funds for Red Nose Day. 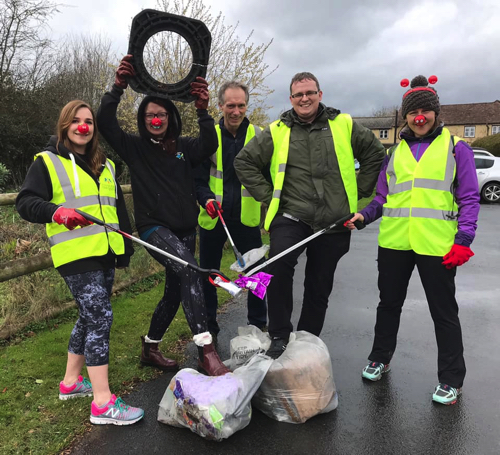 On Friday (15 March), the group donned red noses and deely-boppers to jog along Worcester Road in Malvern in an attempt to pick up as much litter as they could in one hour. Five bags of litter were collected and more than 7,500 steps were taken, with some unusual items including a baby’s shoe, a car tyre, a car bumper and cardboard boxes. Nearly £200 has been raised for Comic Relief so far, which includes a cake sale at the Council House earlier in the week. The event was also part of the council’s efforts to support this year’s Great British Spring Clean which runs from 22 March to 23 April.